Sandwich heavyweight Subway has recently launched their newest special, a pastrami sub. For those of you who, like me, had no idea what exactly pastrami is, here’s a crash course. Pastrami is a deli meat generally, but not always, made from beef. It’s brined, seasoned, smoked and steamed, and ends up looking a bit like bacon and tasting a bit like corned beef (both good things). It’s often served on rye, sometimes with coleslaw in a variant of a Reuben. However, since Subway didn’t outfit their restaurants with coleslaw, Russian dressing, and rye bread, I decided to fill my Big Hot Pastrami out West Coast-style, with pickles and mustard. 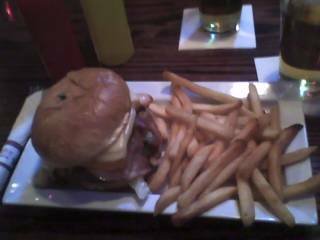 I loved this sandwich. They heaped on the pastrami, which had a nice, distinct flavor and seemed to be pretty high-quality (although since this is my first pastrami experience, I have no idea if it tasted how it’s supposed to). The pickles and mustard added some kick and offset the peppery taste of the meat nicely, and the provolone cheese I selected was subtle enough to let the rest of the sub work. I wouldn’t recommend a stronger cheese like cheddar on this, keep it light. The Big Hot Pastrami was a delicious sub and a nice change of pace from the usual “chicken breast with a new dressing” specials Subway usually puts out. As a specialty sub, it’s going to cost a bit more, with a 6″ setting me back $5. I’d still wholeheartedly recommend this sub, pick it up while you can. EDIT: This post has gotten a number of comments, which of course I’m thrilled about. I do want to make sure everyone reading understands that this is an independent review. I am not affiliated with Subway. This is not an online survey, nor do I have any information on an online survey for patrons who have enjoyed the Big Hot Pastrami. I hope that clears up any confusion. Burger King is currently running a special on their Original Chicken Sandwich, so if you buy one, you get one for free. You’ve probably seen the commercials and ads, and it looks like a pretty good deal. However, there are some issues which need to be addressed. First of all, the Original Chicken Sandwich is not the same as the Chicken Club which appears as part of the combo meal. Unlike the Chicken Club, the OCS consists of a chicken patty, lettuce, and mayo on a sub-style bun. It’s only available a la carte, and it costs $4. Two sandwiches for four dollars isn’t a bad deal, but there isn’t much “free” about it. The lettuce on here actually looks less appetizing than in reality, but maybe that's just me. The other problem is that this isn’t a sandwich I can eat two of in rapid succession. I’m not a stickler for the quality of food at a fast food restaurant. If I want something organic, free range, all-natural, etc. I’ll go somewhere else. But there’s something a bit… off about the chicken in the sandwich. The patties are about twice as long as a regular burger or sandwich, owing to the longer bun, and about halfway through the second sandwich I was tasting a really artificial undertone. It wasn’t so terrible that I’d throw the sandwich in the trash, but if a sandwich consists of only three ingredients, you have to make sure all three are about as good as they can be. I don’t mind the Original Chicken Sandwich, but I wouldn’t recommend making a special trip for this “deal”. But fear not!! In my travels, I also discovered another BK sandwich. Unlike the OCS, this little burger is only about $1.25. It’s called the Rodeo Cheeseburger, and it consists of a patty, cheese, BBQ sauce, and two onion rings. Mine was a bit heavy on the sauce but other than that, everything came together really well. It’s a neat little addition to the menu not found anywhere else I can think of, and it’s cheap enough to go out on a limb for. Try it next time you’re at Burger King. It may be a bit hard to find, since it's not mentioned on the website. Happy trails!! Happy New Year!! 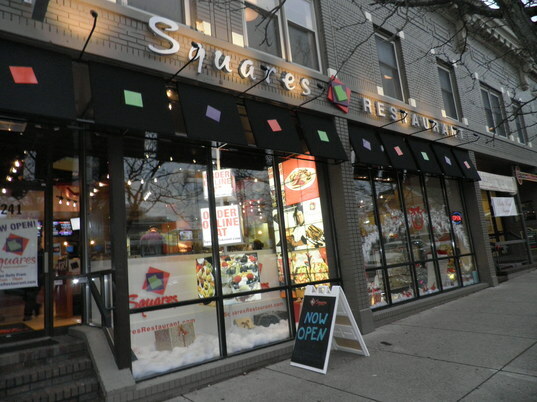 Squares Restaurant is a recently opened, upscale salad and sandwich-type restaurant on Liberty St. in Downtown Ann Arbor. I noticed it a couple of days ago and then got a coupon for it, so I decided to check it out. Squares offers a couple of flatbread wraps featuring gyro meat, chicken, veggies, and other options. I decided to go with the Chicken Square. I didn't get a picture of the sandwich, but here's a picture of the location. Cozy! The Chicken Square consisted of chicken, lettuce, tomato and “Square sauce” on a flatbread. The chicken was high-quality, nicely prepared and thoroughly delicious. The lettuce and tomatoes were fine, and the sauce was good, although hard to describe (it had paprika, and was kind of like tzatiki sauce but not, if that makes any sense.) A great wrap, all in all, and it would’ve worked with any of the other meats they have available too. The downside was the price. With my (one day only) coupon, my Square was $2, an unquestionably good deal. However, the average sandwich usually runs for about $6, and that’s not including any side dishes or drinks. A satisfying lunch would probably cost you around $10. It’s not that I don’t recommend Squares; I do. It’s just not a place to stop by when you’re out shopping or something. I’d recommend it as a destination lunch once in a while, especially if they’re having a deal.